The 7 RAPTOR is a .284 caliber / 7mm AR-15 cartridge designed for target shooting and medium game hunting out to 300 yards. The cartridge and chamber design are optimized for AR-15 magazine loading at a 2.26 inch overall length using AR-15 standard 5.56 bolt and magazines. The 7 Raptor is ideally suited to bullets between 100 grains and 130 grains in weight. However, the 7mm Raptor can handle 7mm bullets up to 168 grains while keeping within a 2.26 inch overall length for the AR-15. Which brings us to the reason or really the question… why develop the 7 RAPTOR when there are cartridges like the 6.5 Grendel, 6.8 SPC or 300 Blackout? When I started the 6.5 project back in 1998 that led to the 6.5 Grendel (Yes, that was me), the project was focused on high-power match rifle competition conducted at 200, 300 and 600 yards with hunting use being secondary. The goal was to create a cartridge that, in magazine length loading, would surpass the 223 Remington shooting 80 or even 90 grain bullets single round loaded. For all that the 6.5 Grendel did accomplish, it did not come without compromise or expense. 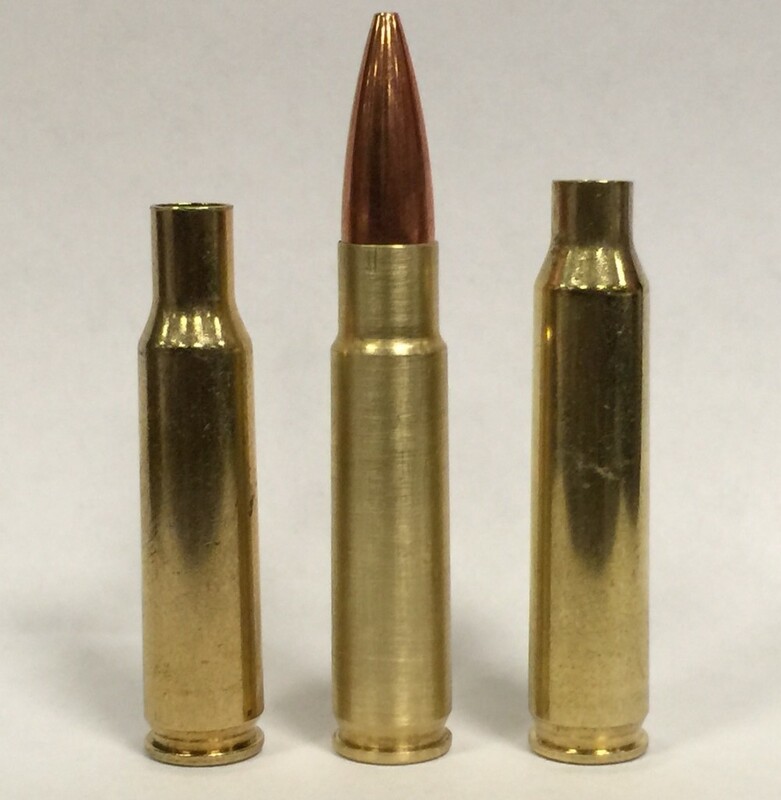 Today, 6.5 Grendel brass costs from between 60 cents to over $1 per piece. Add in the cost of a non-standard bolt and special magazines, and the 6.5 Grendel is more expensive to build and shoot than a comparable 223 Remington rifle. The 6.8 SPC is really no different than the 6.5 Grendel requiring non-standard magazines and bolt plus 6.8 SPC brass is still more expensive than 223 Remington. The 300 Blackout has come along as a re-creation of the 300 Whisper which has been around for over 20 years. 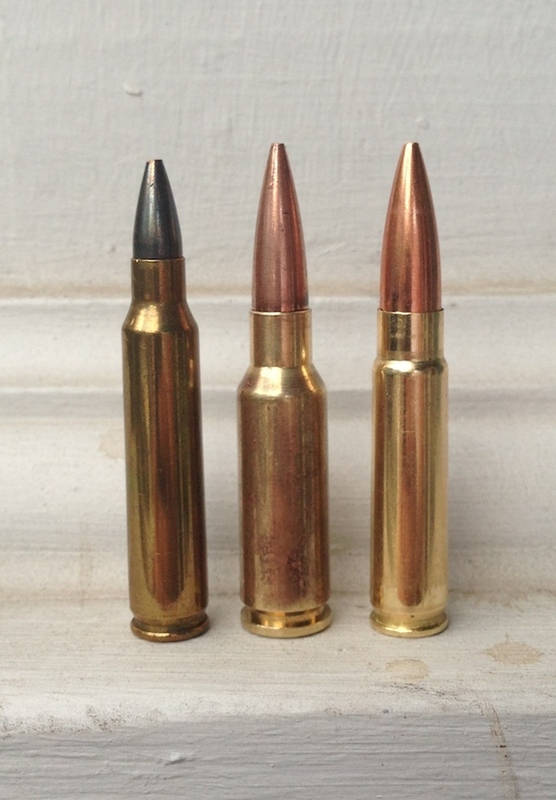 While the 300 Blackout retains use of the 5.56 bolt and magazines, the cartridge is marginal in supersonic loadings as a hunting round on medium game like whitetail and feral hogs. Don’t get me wrong, the 300 Blackout or Whisper is a fun little cartridge, but 2350 fps with a 110 grain bullet is not a 300 yard hunting cartridge. So with the 6.5 Grendel project behind me, the challenge became could I develop another cartridge for target shooting and medium game hunting for use out to 300 yards and keep it cost effective and simple. To achieve this goal, the design criteria of the cartridge specified that it possess many of the same key dimensions as the 223 Remington to allow use of the standard 5.56 bolt and magazines. As well, being based on the 223 Remington would give the end user an abundant source of economical brass to work with. Finally, the design criteria required that the cartridge maintain close to a “one caliber” neck length to support the bearing surface of the bullet. With the parameters of the parent case decided, the next step in the process became the decision on caliber. In considering caliber options, 7mm offered improved external ballistics over 30 caliber when comparing equal bullet weights. In comparing 7mm to 6.5mm, 7mm bullets are shorter, comparing bullets of equal weight, preserving powder capacity in a small capacity case constrained to 2.26″ OAL. In addition, it was found that a 7mm cartridge would not interfere with the forward ribs of standard 5.56 AR15 magazines allowing loading to 2.26 inches without restriction. In creating the final design, the cartridge is formed from either 223 Remington or 222 Remington brass with a full “one caliber” neck length for proper bullet bearing surface support. Finally, the case capacity and caliber combination proved ideal for widely available powders such as AA5744, AA1680, AA2200, Reloader 7, H4198 and Vihtvouri N120. While others have attempted wildcats that amount to a shortened 7 TCU, the 7 RAPTOR is not a shortened 7 TCU. The 7 TCU is created by necking up the 223 Remington and fireforming the case to create a 40 degree shoulder and remove the body taper. Shortened versions are created by machining the base of TCU dies and by holding short a standard 7 TCU reamer. In contrast, the 7 RAPTOR retains the body taper of the 222 Remington and forms the shoulder angle at the same time as expanding the neck from .224 to .284 with a full length resizing die fitted with a tapered expander. Since the 7 RAPTOR is designed for a semi-automatic rifle, clearances were introduced to enhance feeding and extraction compared to the 7 TCU which was designed for a single shot handgun. Taken further, the throat design of the 7 RAPTOR was created for a 2.26″ overall cartridge length using the ideal bullets in the 100 to 130 weight range. In comparion, the throat design of the 7 TCU was designed for loading bullets “long” to overall lengths as great as 2.5 inches and this would create excessive free-bore even when shortening the cartridge from the back end. Forming the 7 RAPTOR from 223 Remington is easily accomplished in 3 steps. First, shorten the 223 Remington Brass using a miter saw to 41mm (this can be accomplished with a case trimmer, but you are removing almost 4mm). Second, resize the shortened brass using a 7 RAPTOR full length resizing die. Finally, finish trim the formed case to 40mm using a power case trimmer. 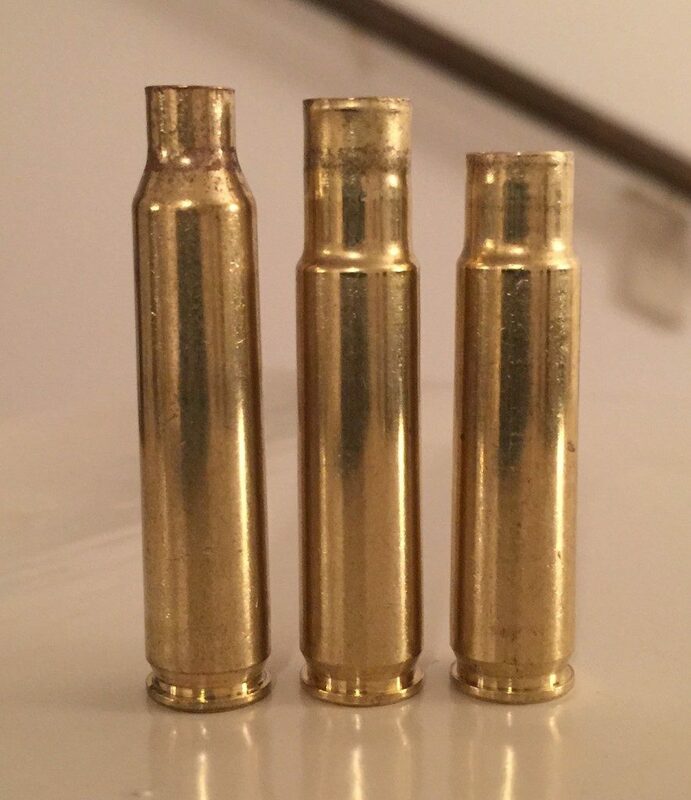 As discussed earlier, 222 Remington brass can be used with less trimming and forming required. A 7 RAPTOR test rifle with a 24-inch stainless barrel to test performance across the full range of barrel length options. The only change on this AR-15 was switching barrels to 7 RAPTOR – All other parts are standard 5.56 including bolt and magazine. 100 Grain Sierra HP, 110 Grain Speer TNT, 115 Grain Speer HP, 120 Grain Sierra Pro Hunter, 120 Grain Hornady HP, 120 Grain Hornady VMAX, 130 Grain Speer Hot Cor and 130 Grain Speer BTSP. Additional bullets not pictured that would be ideal for the 7 RAPTOR include Barnes 110 or 120 grain TTSX and the Nosler 120 Ballistic Tip. All tests were performed at cartridge OAL of 2.26 inches using Winchester 223 Remington brass that had been formed and trimmed to 7 RAPTOR. Tests were performed using X-Caliber 8 twist 5R barrels with ammo loaded using modified Lake City Brass with a CCI 450 primer and standard Lancer and PMAG’s. At 2525 fps, the 110 Speer TNT, arrives on target at 300 yards with 1806 fps terminal velocity and 797 ft-lb of energy. +/- 3 inch flight path maintained to 250 yards. California Users, we will be working on loads for the Barnes Tipped TSX in both 110 and 120 grains weights to meet your new lead free hunting regulations. What are our plans with 7 RAPTOR? 7 RAPTOR barrels are available from X-Caliber barrels. If you want a custom built upper, call Medesha Firearms at 480-986-5876. For Reloading Dies, Whidden Gun Works will produce custom die sets but you will need to call to order them. To help get the cartridge going, North American Sportsman, LLC has 7 RAPTOR dies in stock. The cost is $125 including USPS Priority Mail shipping. To order email arne@northamericansportsman.com with your name, address and phone number and we can get them right out to you.